Sturdy steamer trunks make versatile storage containers and decorative tables, but opening one that has been closed a while may be less than pleasant. The paper or fabric lining inside the trunk may sour or have hidden mold underneath the surface. This condition occurs if the trunk or its contents have gotten wet at some point. Whether sprucing up a flea market find or pulling down a trunk from the attic, air out and clean up your trunk. 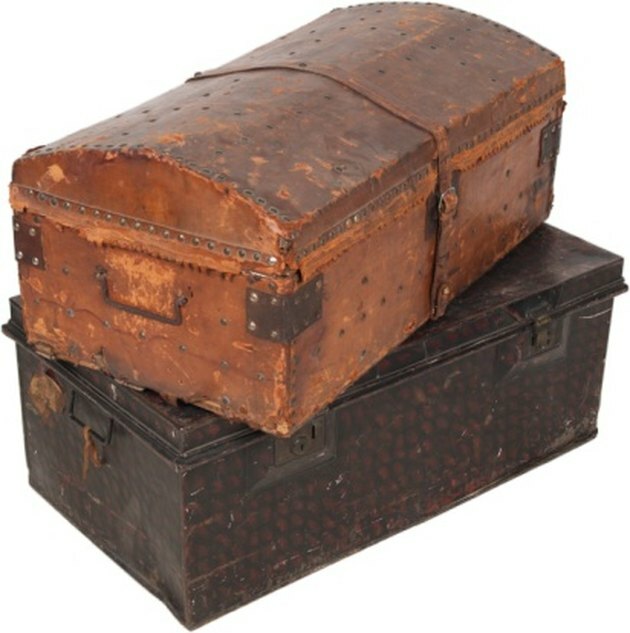 Steamer trunks have strap or metal closure bindings. Put on a breathing mask to prevent the inhalation of mold spores and allergens. Open the trunk by lifting the lid fully. If the lid will not stay open, have someone hold it for you while you work on the steamer trunk's interior. Cut away the interior lining by sliding the craft knife over the fabric or cloth interior. Slice carefully without cutting yourself or the trunk. Cut away the interior completely. Pull away the lining and throw it away. Scrape away the glue left behind in the interior with a putty knife. This may take a several minutes or even hours depending on how brittle the old glue is. Spray with a bottle of water to soften stubborn glue. Examine the top of the trunk lid. If the trunk lid is lined, it needs removing, too. Use the same procedure on the lid of the trunk. Mix warm water and beach together in a pail. The ratio needs to be 10 percent bleach and 90 percent water. Wet a soft cloth with the solution, wringing the excess from the cloth. Wipe down the trunk's interior using the damp cloth. Do not over saturate the trunk. Allow the trunk to sit open for two to three days. Sand the interior of the trunk with a piece of fine grit sandpaper. Brush away the grit with a soft, dry paintbrush. Coat the inside of the trunk twice with clear oil-based polyurethane to seal it.